The network is designed to provide a guaranteed 100% Internet service availability. The services are delivered from the Autonomous Systems Number (AS) 57866 on a footprint of data centers in The Netherlands and the US. In both countries, we connect to tier-1 upstreams, strategic private peering partners and some Internet exchanges. Our network provides non-overbooked, high performance access to the Internet and directly to networks of cloud providers, such as AWS, Microsoft Azure and Google Cloud. Fusix routing policy towards our customers is to provide the best routes that we have (not the cheapest). In addition, we go for stability: we prefer to set up a dedicated cross connect to a tier-1 provider and only use part of their routes, rather than connect to an Internet exchange where hundreds of members may or may not announce to us routes that they may or may not be allowed to announce. We have a selective peering policy and for stability reasons may choose to send traffic to other parties over a link that we need to pay for, instead of sending traffic to a peering link for free. 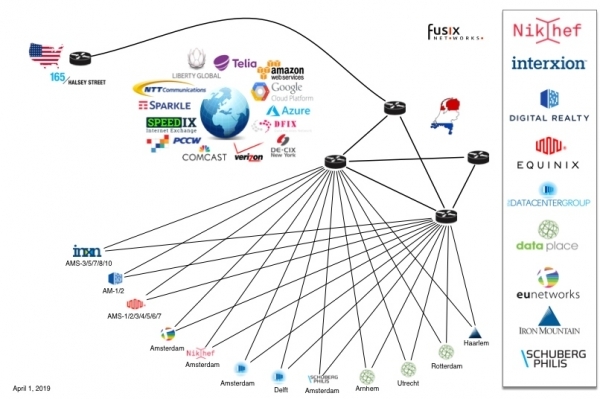 The Fusix backbone supports IPv6 and IPv4 natively and offers Internet services to both IPv4 and IPv6 networks using BGP (Border Gateway Protocol) or default routes. Our network is managed by the Fusix Network Operation Center in The Netherlands, using a management platform that is deployed redundantly: one inside our own backbone and one independent from us. Most of the network configuration tasks – such as IP address prefix management – are automated, which allows the NOC staff to deliver and maintain customer-connections fast and without human errors. Network supervision and monitoring are handled by consolidated open source diagnostic tools that produce fault reporting alarms and monitor physical connectivity and routing behavior for each customer connection.